No-cook meals are the way to go when the temperature skyrockets and the humidity leaves you in a crying, sticky heap on the floor (that’s not just me, right?). 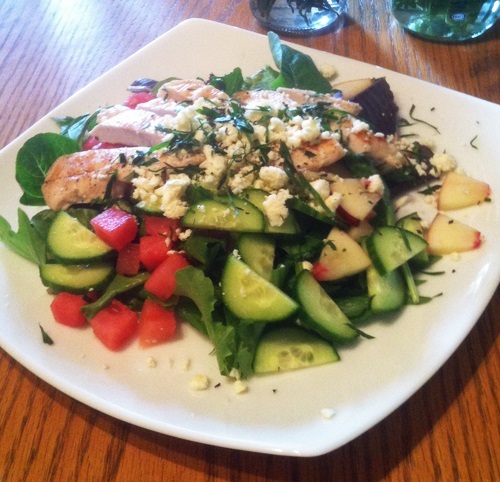 Chef J has you covered with this super summer salad. Customize it to your tastes and use as a side or the main course. Pick up a loaf of bread on your way home from work and call it a night. No-cook meals could very well save my sanity this summer, so thanks, Chef J! This town is too hot! So instead of cooking, we’re just going to throw some stuff together, grab a beer (or glass of white wine with an ice cube…), and plop down on the couch. Turn down the AC and crank up the Netflix — we’re chilling out with a cold salad! The kids still say “chilling out,” right? Never mind; I don’t care what the kids are saying these days. You can add some grilled chicken, salmon, or shrimp to the mix if you would like. You can also throw in some avocado if you can find some good ones at the market. Or toss everything together and wrap it up in a tortilla so you can eat it in the car. This salad is great with whatever fruit you have growing on your tree or a handful of fresh berries; just don’t over-think it. Be cool! No-cook meals are all about being cool. Makes two large or four small portions. Whisk all ingredients together until emulsified. Arrange everything so that it looks pretty or just toss it together. Serve it with plenty of air conditioning and maybe a light, citrusy summer ale.